Routine Maintenance on Oct.25th, Let's Have A Break! 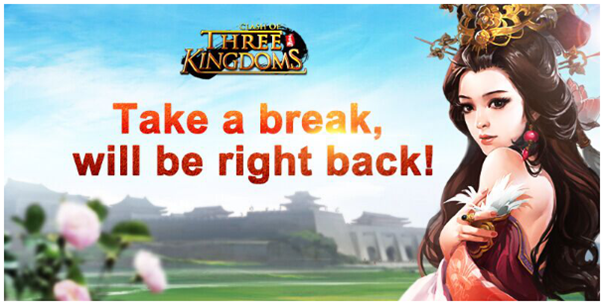 Clash of Three Kingdoms will undergo routine maintenance from 12:30 p.m. on Oct.25th 2018, which will last about two and half hours. During that time, you will be disconnected from the game. Besides, the merger servers will be reopened later than other servers. Thank you for your patience. 04:30 Thu. Oct.25th 2018 (GMT).